(Concord, NC May 9, 2018) – Defending Bandit Series champion Ricky Rude (#14) is doing everything he can to ensure back-to-back titles. Rude took the lead on lap six of the a-main feature race at Concord Speedway Saturday night and never looked back, securing his first feature win of the 2018 season. "I'm just tickled to death to get back in this spot," Rude said. "I kept telling my spotter, ‘Tell me how many laps are left. I gotta get this done!'" 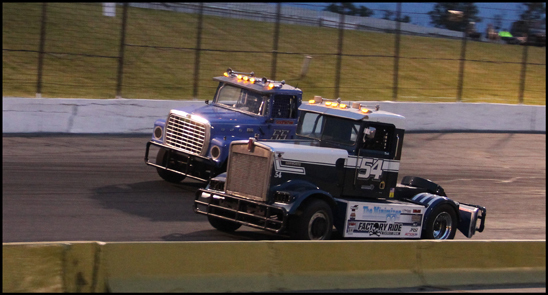 Multiple yellow flags didn't help Rude's cause, but he wasn't too worried. "I knew the yellow flags would come out. It never fails, but I'm used to it," Rude said. Two other Bandits that had themselves a night – Mark Noble (#74) and Justin Ball (#17). Noble won the third heat race and first challenge race, narrowly holding off Rude each time. Ball won the second challenge race as well as the Bandit Shoot Out. Ball's Shoot Out win netted a local youngster, James, a crisp $100 bill, which he said he would use to "probably take my mom out for Mother's Day." Kruckeberg Motorsports had one of their best nights ever. Not only did Noble pick up two wins, but Tyler (#54) and Craig Kruckeberg (#55) finished second and third in the a-main feature race. "I was just following (my son) Tyler. He got loose a couple times so I had to get loose a couple times," Craig said. "It was a struggle at the end," Tyler said. "Ricky just had a little more power than me, so he was pulling away on the straightaways and I was trying to make it up in the corners. I just couldn't get to him fast enough. Hopefully, next race I'll have a little bit more power." The next Minimizer Bandit Big Rig Series event has a midwestern flair. Hawkeye Downs Speedway in Cedar Rapids, Iowa, is one of only a couple return tracks on the 2018 schedule. "Last year's event was fantastic," Bandit Technical Director Brian Madsen said. "Fans loved it and we expect a similar response next month." 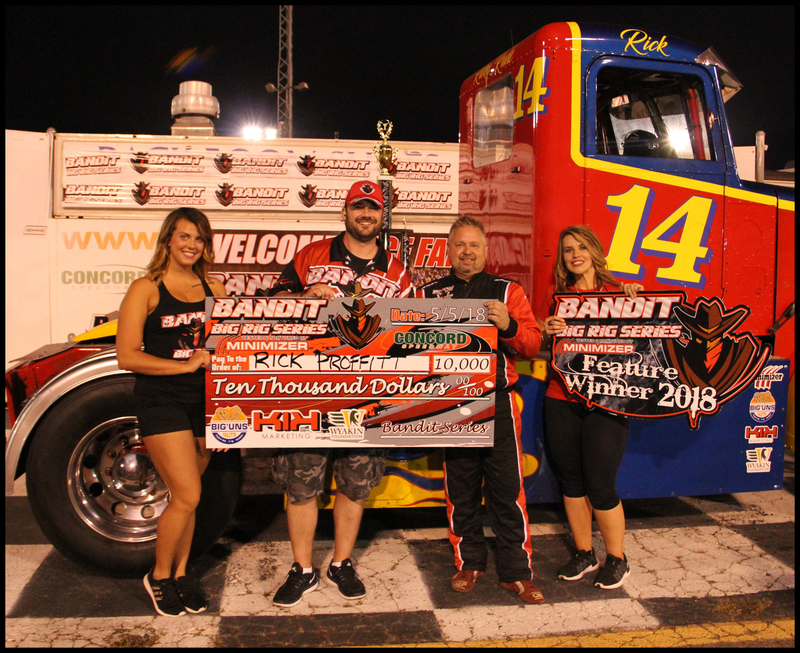 The Bandits race at Hawkeye Downs on June 9, 2018. Fans can get tickets to any Bandit event in 2018 by clicking the banner below and going to the official Bandit website.